Apple’s WWDC 2013 keynote presentation was another one for the history books, seeing that Apple made some changes that are sure to please tech enthusiasts and journalists alike. As I reported in an earlier article (WWDC 2013 Confirmed), Apple introduced iTunes Radio (what I called “iRadio”) as well as AirDrop file sharing into iOS 7. Credit goes to Wall Street for informing us on these pieces of info early on. It took some of the suspense out of the presentation, which helped me regarding what to expect. 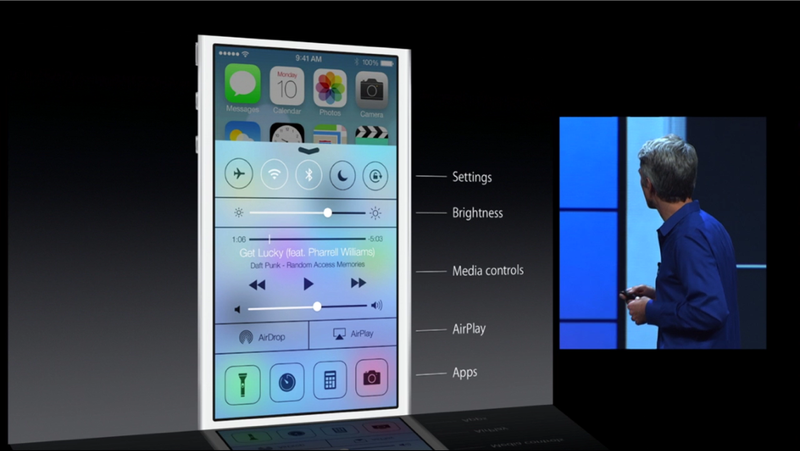 Control Center will now be available from both your home screen and your lock screen, a change from before. In iOS 6 as in previous updates, settings were only accessible from the home page and were buried within one of the apps. If you were busy listening to music or writing an email, you had to click out of the mail or music app, click on the settings icon, then select which setting you wanted. Now, you can swipe up from the bottom of the lock screen or home screen and access settings such as WiFi, Bluetooth, Do Not Disturb (DND), airplane mode, phone lock, Air Drop, screen brightness, camera, calculator, AirPlay, camera, calculator, as well as music, volume, and even a flashlight. In the opposite direction, at the top of the phone, Notification Center is still there — but you can now access your Notification Center from the lock screen instead of having to unlock the phone before access notifications. 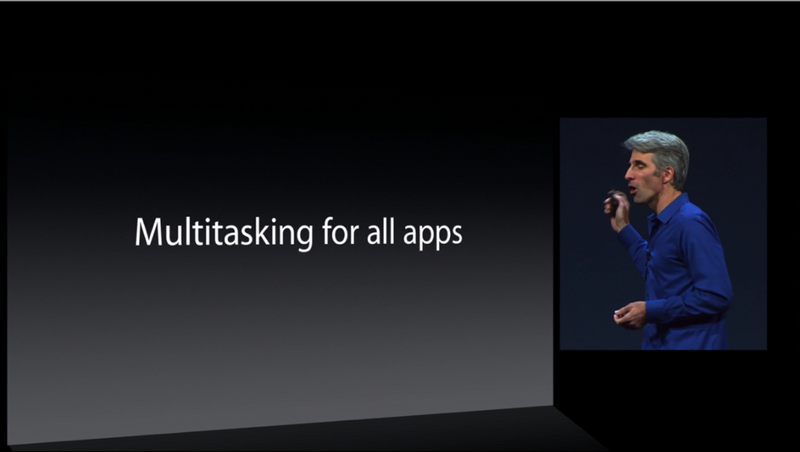 Next on the list of major new features in iOS 7 is multitasking. Multitasking has been hard to come by in iOS 6, even though there are a few apps that endorse the concept that were implemented in iOS 4. However, the lack of multitasking has been one of the most frustrating things about me as an iPhone 5 user (who is constantly taunted by the presence of multitasking on my GS3). 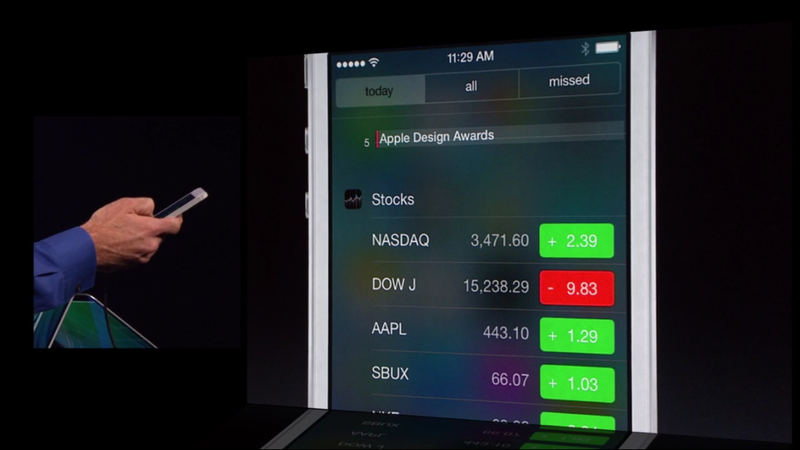 Now in iOS 7, multitasking is widespread and will apply to all apps. This means that apps will no longer stop when you select another application. This will be noticeable to Music app lovers who like to play their personal songs in the music app. I have noticed this many times in iOS 6 and am frustrated by it. I imagine you have been too, but you will need only to wait until this Fall to have better multitasking on your iPhone, iPad, or iPod Touch. Intelligent scheduling involves updates for your apps that are in-sync with the times in which you use them. For example, if you use your Facebook app all the time, then iOS 7 knows to constantly update your Facebook app throughout the day because you could use it at any time. In contrast, if you check your Yahoo email once in the morning and once at night, your Yahoo app will update right around the times in which you use it. Intelligent scheduling involves the decision of iOS 7 to update your apps right when you need them most so that your apps will update before you pick up your iDevice to check email or update your Facebook status. Next on the list of multitasking capabilities in iOS 7 is opportunistic updates. Opportunistic updates occur when your device is awake during the day. Many users wake their devices several times during the day, and iOS 7 will begin updating apps in the background while you watch YouTube videos, send emails, or listen to your iTunes music. The new update, iOS 7, also adapts to network conditions. Network conditions are not always optimal depending on where you are; usually, coverage can be compromised when iPhone users are in buildings (just ask AT&T and T-Mobile customers). The new iOS 7 upgrade will discern whether or not your iPhone is in a network where WiFi or cellular connectivity is strongest and upgrade only on strong Internet networks. IOS 7, then, will take advantage of these random times and update apps so that you will have the latest updates when you find yourself in an area where the network is slow, failing, or down. IOS 7 will also take advantage of coalesced updates. The word “coalesce” means “to unite, to fuse,” and this is exactly what will happen with your app updates in iOS 7: while your phone is awake and you are in ideal network conditions, your apps will use the network radios within your iPhone to update all your apps. This means that you will not have to update your apps manually; instead, your apps will be updated automatically. Push triggers, the last of the multitasking capabilities, will allow your apps to update whether or not you respond to the notification. By the time you get to view your notifications, the apps will have already updated on their own. This will allow you to view what apps were updated without having to take time to manually select “update” for each one. Safari now provides full-screen interface by which you can view a web page from one side of the iPhone to the other. There is a smart search field inserted into iOS 7, one of the features of Google’s Chrome OS that allows you to find sites right from the top of the web page. Parental controls are now in place for parents to restrict their child’s access to the web as well as the kinds of content they deem appropriate for their child. One of the new features of Safari that Apple included within its Mac OS (called “Mavericks”) this year is called “iCloud Keychain.” The concept of the keychain is that it is the object that “binds” the keys together. This is the concept with iCloud Keychain: now, iOS 7 will maintain all of your usernames and passwords across all of your devices without you having to remember multiple passwords at once. Having multiple passwords is a good idea when dealing with the web and the number of Internet hackers. At the same time, it is near impossible to keep count of the numerous sites we use on a daily basis, and Apple wants to help customers stay on top of the many tasks they juggle. Have you been frustrated by Safari before? Chances are you have, if you have spent any significant time in Google Chrome with its “unlimited tabs” that let you pull up one web page after another, after another, after another. This is one of the strengths of Google’s Chrome OS, one that many iOS users like better than Apple’s Safari OS. Now in iOS 7, Apple changes this so that Safari will now allow you to have more than eight tabs open at once. Craig Federighi did not tell the developers audience whether or not we’ll see unlimited tabs, so we’ll have to try this hands-on when the public beta of iOS 7 is released this Fall. Shared Links allow you to keep in touch with articles and links shared by those you follow on Twitter. Bookmarks have been moved from the top of the page to the bottom so that you can get the full screen experience when viewing web pages. The controls for Safari have been more integrated into web pages so that they do not consume as much screen space as before. The Reading List function has been improved. Whereas before, you were only given one article at a time unless you selected another article, you are now given continuous reading from one article to another — no clicking, just scrolling. Select one article and experience a continuous scrolling swoop! Apple made Air Drop file sharing one of its top highlights this year, with Craig Federighi claiming that there is “no need to go around the room ‘bumping’ your phone with others” — a reference to Android’s Near Field Communication (NFC) technology. Air Drop file sharing makes it easy to send photos and documents and seems to be a response to Android’s WiFi Direct. 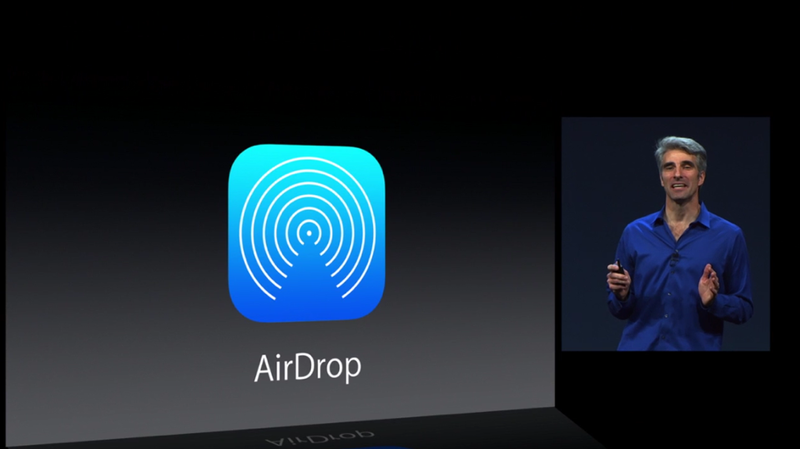 Air Drop uses peer-to-peer WiFi and each file share is securely encrypted, using the latest in WiFi technology. The camera app, once deemed to be “what you make of it,” now comes with four new modes: 1) video camera, 2) photo camera, 3) square or cropped camera, and 4) pano camera. Now, you have access to live photo filters that include black and white film as well as vivid, color photos. With the photos app remaining near the same for the last few years, it was bound for a change. In iOS 7, Apple has now brought the photos app in line with many other Android photo apps, including a new feature known as “geotagging.” Geotagging is a concept by which iOS will now know where you took your photos as well as the time and date in which you took them. This means that you need not be embarrassed by your long array of photos that are not organized into separate files. In iOS 6, photos could be organized into albums manually, as you had to create a new album, then select the photos you wanted placed into the newly-named album. In iOS 7, geotagging will be an automatic feature that will make photo organization effortless. This geotagging feature is called “moments,” and it will organize photos according to year as well. When you want to examine a photo without clicking on it, just hover your finger above the photo and the picture will become enlarged for your viewing. The redesigned photo app also features the significant places you visit as part of the geotagging feature. IOS’s photos app does the hard work so you don’t have to. Some tech writers presumed that Siri would not have any changes made at Apple’s WWDC announcement, but Apple’s own Eddy Cue was there to show off the new Siri. Siri’s got a new interface; when you press the home button, the words “What can I help you with?” appear on the screen, followed by some waves that are a representation of Siri’s attempts to translate what you say and respond accordingly. Last year, Apple introduced Siri by way of Scott Forstall with greater knowledge of sports such as basketball, baseball, and hockey, as well as an increased knowledge in movies and actors and actresses. WWDC 2013 did not introduce new knowledge for Siri, but Siri can now do things she could not do before, such as turn on Bluetooth, increase screen brightness, and play your last voicemail. Siri now has Twitter, Wikipedia, and Bing integration baked right in, so you can keep track of not only Twitter’s social network but also stay up to date on the latest information from Bing’s search engine as well as Wikipedia — the world’s largest encyclopedia, Cue said. To top it all off, Siri now has a clean interface, with the elegant purple and black outline removed. Now, Siri’s microphone icon still stands with a gray background and white trimming. Apple’s recent financial lawsuit with families of children who download apps that are not parent-approved (or the use of apps such as Facebook’s “Bang With Friends,” which was recently removed from the App Store) remind consumers that Apple really does want to protect the innocence of children who live in a world that wants them to grow up, all too soon. The App Store now comes with a local app search and find for iDevice users. Called “Apps Near Me,” the app search does just that — it finds “apps near you” that are useful in your local context. Part of social media involves not only the national and international, but also the local and the regional. Now, social media is about more than just Facebook, Twitter, and Pinterest; it’s also about that small “mom-and-pop” diner down the street. iOS in the Car is one of Apple’s newest features of iOS 7 that will allow car drivers who have “Eyes Free” integration into their vehicles to make phone calls, view maps, play music, and so on using Siri voice command. Twelve auto manufacturers have agreed to partner with Apple in its Eyes Free venture (including Honda, Kia, Volvo, Jaguar, Lexus, Nissan, and others), and iOS in the Car will become a reality in 2014. 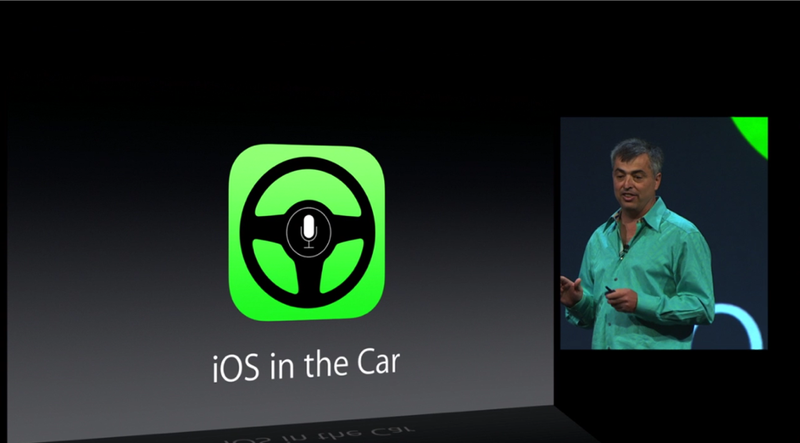 Stay tuned for more information on iOS in the Car. The music app has a different design in iOS 7, but this is no surprise because all the apps have a different look in the new iOS. The music app, however, is more than just a different design; it also includes some unique characteristics than can only be found to date in iOS 7. For one, Apple focused its message in WWDC 2013 on iCloud integration, even with its iCloud Keychain feature that protects all of your usernames and passwords for every site you encounter. Now, Apple provides all of your iCloud songs in your music library as well as your favorite movies and shows so you can have them accessible at any time. Apple is to be applauded for iCloud integration with user music in the music app. Having been an iCloud user for the last year now, I had no idea how practical iCloud could be, though I knew that it was Apple’s own cloud storage utility. ICloud users will appreciate having access to their cloud storage music without having to go around in their settings application and hunt it down. The music app details would not be complete without Apple’s biggest surprise of all at WWDC 2013: iTunes Radio. Called iRadio by many tech enthusiasts, Apple’s music service will be free, though ad-supported. For iTunes Match customers with an annual subscription, iTunes Radio will be offered ad-free. iTunes will provide music that iDevice users love, allowing them to not only change channels and find new ones, but even create their own music channels, sorting them according to certain songs, types of songs, and artists. 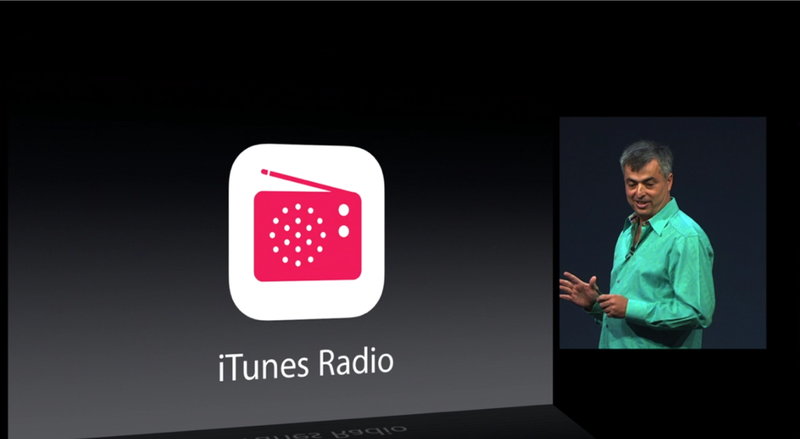 ITunes Radio will be built into the music app. 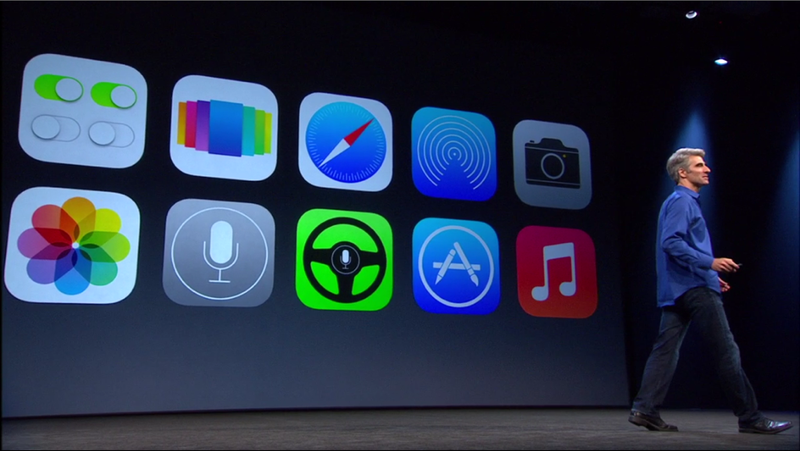 These are the ten features introduced at WWDC 2013. Did you find any of these features to be awesome? Which ones did you like most? Which ones did you like least? Did Apple leave something out of iOS 7 that you wanted to see? If so, let us know in the comments below.